He-Man and the Masters of the Universe Magazine #2 is the spring 1985 issue. This one features activities and stories, following the format of the first one. The magazine is such that it really makes more sense to survey it than to review it, per se, and that’s what we’ll continue to do. There are two stories here, and neither is particularly well done. In “Assault on Castle Grayskull,” we’re expected to believe that anybody would be fooled by Man-E-Faces changing his face, but looking the same otherwise. And where did he get He-Man-caliber strength? In “The Duke of Lorin,” He-Man concocts a needlessly convoluted plan that takes days to implement, then creates an energy field with his sword somehow. 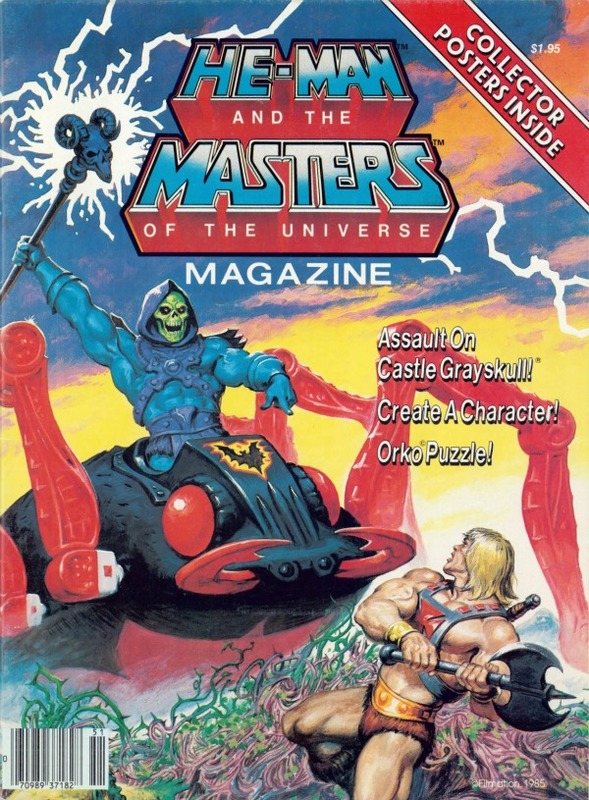 Not content just to give kids a He-Man fix, He-Man and the Masters of the Universe Magazine here tries to confound and confuse them on scientific matters. In a promotion for the Disney film Baby: Secret of the Lost Legend, the magazine states, in a factual way, “some scientists actually believe that dinosaurs still roam the uncharted regions of the world” (p. 9). Seriously? On the same page, there’s also a plug for the gorgeously illustrated children’s book Saint George and the Dragon by Margaret Hodges and Trina Schart Hyman – this is a forgotten favorite from my childhood, and I’m glad to be reminded of its existence (when we get back to the Book Review as usual, we’ll see how it compares to my very fond memories). The highlight, again, is the posters by Earl Norem – one of the cover art and another of Roboto fighting a flight of Rotons.